Winter is upon us, and with it the holidays. The media blitz starts up just after Thanksgiving here in the U.S. as we're inundated with images of Santa Claus, Rudolph the Red-Nosed Reindeer, stockings hung up by the chimney with care--the works. If you'd like to celebrate the season yet avoid Christmas overkill, check out this Winter Windows 7 theme. 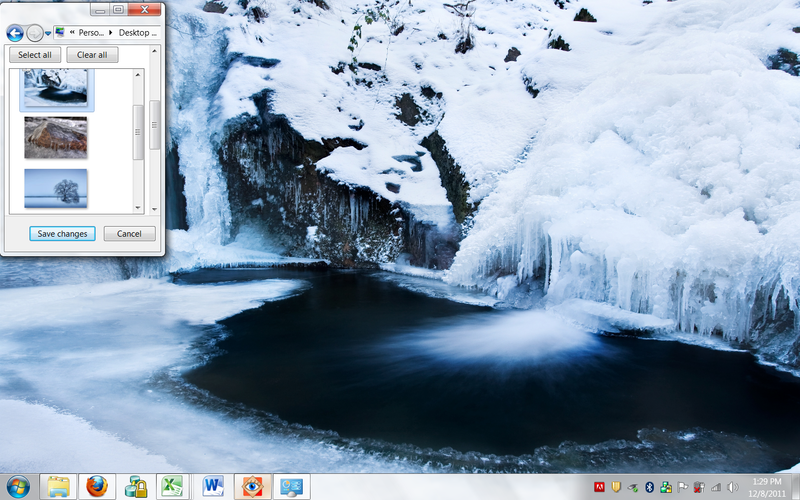 The Winter Windows 7 theme puts five exquisite and unusual snowy scenes on your desktop. In "Ninglinspo Waterfalls on Ice," Geoffrey Gilson presents an otherworldly landscape in which falling water seems to be frozen in time. Mike Nebesniuk gives us an extreme close-up of an ice-covered rock in "Gros Cap Ice Cap." "Sleepless," by Solkku, and "Winter," by Kari Liimatainen, both take snow-covered trees as their subject--but with completely different effects. Finally, in "Winter Wallpaper II," Sven Müller gives us an intimate perspective on a quiet stream in a snow-shrouded forest. These photographers are all members of the DeviantArt online community; be sure to visit the website for more amazing artwork. Take a different perspective on winter with these thought-provoking snowy landscapes.